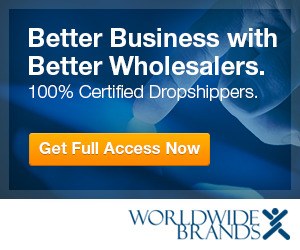 Worldwide Brands are THE Product Sourcing Experts for Home E-Biz and the publishers of OneSource, the World’s Largest Source of eCommerce Wholesalers. Their full-time research staff is dedicated exclusively to keeping OneSource updated with new Wholesalers willing to work with online businesses. Radio, and the Writers and Hosts of Product Sourcing Radio, one of the top-rated shows in the wsRadio Business Network. Members in good standing of the BBB Online Reliability Program, they are committed to helping online entrepreneurs gain the knowledge they need to succeed. Their web site offers E-Biz Owners a vast knowledge base of educational materials on the importance of REAL Product Sourcing.